Thanksgiving brings wonderful opportunities for a variety of tablesettings. The rich colors of autumn provide an endless supply of inspiration for decorating the table. In this tablescape (which does not have to be reserved solely for the Thanksgiving holiday), I am using Victorian English Pottery “Pheasant Woodland” dinnerware that has a distinctive fall theme. It’s one that can be used throughout the entire autumn season. Like a lot of English transferware, this pattern tells a story and has earthy colors; however, I also recognize that it is a busy pattern. In order for the dinnerware to stand out on the table, it benefits from the use of solid-colored charger plates to frame and “ground” each place setting. Busy-patterned dinnerware also looks best on solid-colored placemats or tablecloth. When I am using this type of dinnerware, I want it to stand out on the table so I ensure that other elements on the table, including the table covering, don’t compete with it for attention. To add a punch of color, I have used my plaid napkins encased in natural-toned napkin rings. The orange in the napkins ties in with the shades on the pheasants in the dinnerware pattern. Placing the napkin on the side of the plate (as opposed to across the top of the bowl) allows the dinnerware pattern to be displayed for maximum impact. 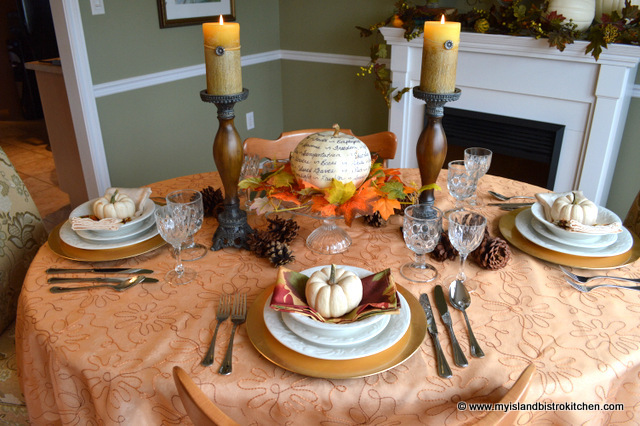 Again, because the pattern of the dinnerware is quite busy, I have kept the centerpiece relatively simple – a traditional-styled fall-themed arrangement in the centre flanked by two pillar candles on glass candlesticks. The use of the glass candlesticks keeps the focus on the centerpiece. The colors in the centerpiece correspond to the color scheme of the dinnerware. With this classic style of tablesetting, it is important to maintain the colors of the dinnerware in other elements of the table – for example, the centerpiece, candles, napkins, and charger plates. The leaf-etched neutral-colored candles blend with the color of the centerpiece urn and the background in the dinnerware. The candles and their placement add symmetry to a classic tabletop centerpiece. So, only three items in the centerpiece – two candles and the floral centerpiece – to keep it clutter-free. This is particularly important if the table is not large. I wanted to see some clean white space on the table. In keeping with the style of this dinnerware, I have used some of my vintage glassware which also blends with the candlesticks. Clear glassware adds life and sparkle to a tablesetting and also gives it an airy look and feel. I hope you have enjoyed a glimpse of my Thanksgiving tablesetting. 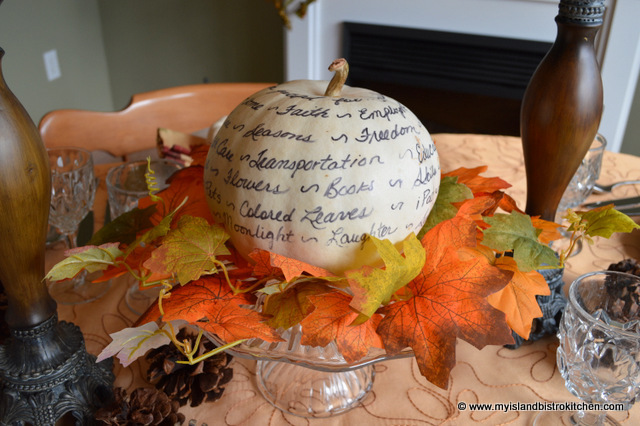 The autumn got away from me and I did not get around to sharing my 2014 Thanksgiving tablesetting. When I realized it was too late to share it on my blog for the Canadian Thanksgiving in October, I knew I’d have a second chance in late November to share it in time for the American Thanksgiving. So, this one is for our American friends to the South who will celebrate their Thanksgiving tomorrow… if you haven’t already set your Thanksgiving table, this one is quick and easy! I went with a fairly simplistic setting this year. I started with an ivory tablecloth topped with a piece of orange drapery sheer. As you have probably noticed with my tablesettings, I tend to go for plain table coverings which make other elements of the tablesetting stand out. I also try, where possible, to use props that I already have like, for example, the tall wooden candlesticks. The warmth of the wood seemed to work well with the autumn props. Scattering a few brown pine cones pulled the color scheme together. The focal point of the table is the small white pumpkin perched on a glass cake stand and surrounded by colored leaves. With a black marker, I simply wrote, round and round the pumpkin, all the things I am thankful for. I used my standard gold charger plates topped with my everyday white stoneware dinnerware. 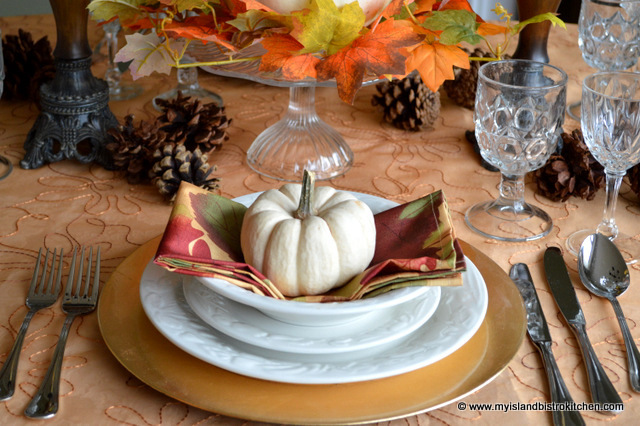 A quick fold of the napkin placed in the soup bowl makes a colorful nest for the little white ornamental pumpkins which tie in with the white pumpkin centerpiece. I love to decorate my fireplace mantles. 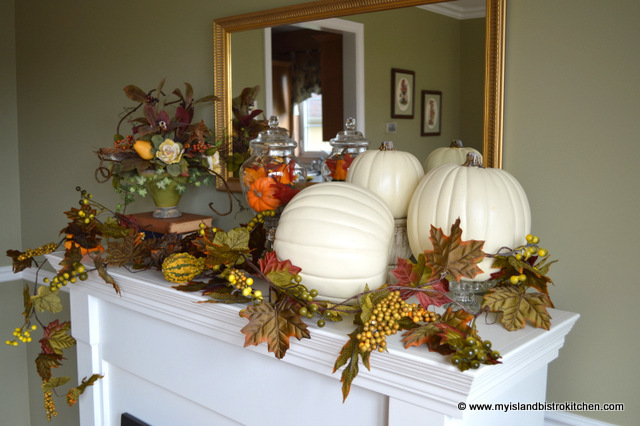 A few white pumpkins, a garland of some colored leaves, a floral centerpiece, and a jar of mini orange pumpkins for a splash of color, and the look is complete. This was a fairly easy, quick, and economical tablesetting to achieve. It’s suitable, obviously, for a more informal Thanksgiving dinner. My good China has a border of pink florals so really doesn’t blend well with the colors of autumn. That’s why white dinnerware is always a good choice as it goes with anything and food always looks so eye-popping when served on it! Happy Thanksgiving to our American family and friends to the South!